Deep learning opens up new worlds of possibility in artificial intelligence, enabled by advances in computational capacity, the explosion in data, and the advent of deep neural networks. 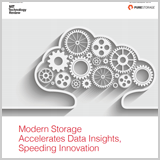 But data is evolving quickly and legacy storage systems are not keeping up. Read this MIT Technology Review custom paper to learn how advanced AI applications require a modern all-flash storage infrastructure that is built specifically to work with high-powered analytics, helping to accelerate business outcomes for data driven organizations.